Without the right kind of oil, your car will suffer from poor performance and an increased risk of potential engine failure. Most modern cars do best when given synthetic oil. On your mark, get set and let’s go! Who Should Use Synthetic Oil? What’s the Best Type of Synthetic Oil? Here are the answers to some common questions about buying and using the best synthetic motor oil. Remember to also consult your owner’s manual (if you don’t have a physical copy, check out the manufacturer’s official website). Manufacturer’s recommendations on the type of oil, frequency of oil changes and more are all specifically designed to deliver top performance and safe operation for your specific vehicle. Motor oil is divided into two types: synthetic and conventional. Synthetic motor oil is chemically engineered to be a pure lubricant. These oils are contaminant-free, with every single molecule designed to promote lubrication. Because they’re lab-engineered, they’re made without impurities. Their internal molecular structure is uniform with no discrepancies. Conventional motor oil (also called standard motor oil) is refined from crude oil. The refining process for crude oil is different than the one for synthetic motor oil. Molecules in conventional motor oil will have similar weight but differing structures, which affects performance. Additionally, conventional oil will always have at least a low level of contaminants such as sulfur, nitrogen, oxygen, nickel and vanadium. Generally, most experts agree that synthetic motor oil is usually the best option for most modern cars. Synthetic motor oil has no contaminants or impurities, so there’s less friction on the engine. Synthetic motor oil also helps increase fuel efficiency. Plus, synthetic oil helps protect your car from damage caused by both extreme hot and cold. The main disadvantage is cost. Synthetic oil is often anywhere from two to four times the cost of conventional motor oil. However, the price difference is not quite as clear-cut as it might first seem. Synthetic oil lasts about three times as long as conventional oil. By using synthetic motor oil, you don’t have to change your oil nearly as often each year. While specific results will vary, you could be looking at using anywhere between 15 to 24 fewer quarts of oil each year. So conventional oil is really only a savings at the checkout counter. Because you have to change synthetic oil-less, you don’t have to buy it as often. So, for most drivers, conventional oil is actually the best value over time. Use synthetic motor oil if you drive your car in either consistently cold or hot temperatures. Synthetic oil can operate normally in a much higher temperature range than conventional oil. Remember, the temperature inside your running engine is much hotter than the outside temperature. If you frequently drive in areas where the outside air is 70 degrees or higher, conventional oil could break down and cause engine damage. Synthetic oil is the best choice for cold temperatures, too. Conventional oil typically doesn’t provide enough protection against engine wear during cold-temperature startup. Only synthetic oil can keep your engine flowing in frigid temps, especially below zero conditions. Synthetic oil won’t break down as quickly under heavy engine strain. If you’ll be towing a car, pulling a trailer or otherwise hauling cargo, make sure you’re using synthetic oil. Standard oil might not be able to provide enough lubrication for engine components operating under maximum power. Older engines have an increased risk of sludge buildup. If too much gunky residue is allowed to accumulate through the engine, oil passages can be blocked and extensive damage can occur. Oil sludge is caused by oil breakdown over time. This was an especially pronounced problem in Chryslers, Toyotas and Volkswagens in the early 2000s. Regular use of synthetic oil helps remove existing oil sludge. Plus, synthetic oil helps prevent new sludge from building up in the future. You’ll definitely want to use synthetic oil if your daily driving consists of lots of short trips, stop-and-go traffic and similar conditions. Conventional oil needs time to warm up in order to burn off impurities and moisture. Short trips don’t allow enough time for the conventional oil to warm up to the proper temperatures, so oil breakdown occurs relatively quickly. Synthetic oil warms up faster. Plus, synthetic oil doesn’t contain any impurities to begin with. So it’s able to lubricate longer and won’t potentially cause engine damage. A very general rule you’re like to hear is the “3 or 3” rule. You should change your oil either every three months or every three thousand miles. While there’s nothing wrong with following that guideline – you certainly won’t harm your car doing so – many vehicles don’t require such frequent oil changes. Depending on the type of vehicle, average driving conditions and type of synthetic oil used, your vehicle might need an oil change every 10, 15 or 20,000 miles. This could mean you only need to change your oil every six months or even just once a year. As always, consult your owner’s manual for specific details. While synthetic oil is long-lasting, don’t overestimate its abilities. Regular oil changes are still an important part in the safe operation of your vehicle. Never ignore any warning lights or another onboard vehicle indicators. Not all synthetic oils are the same. Because these are engineered oils, the manufacturing process can make a big difference in the quality of the oil. You’ll want a trusted manufacturer with rigorous quality control standards. You’ll need to select the right viscosity for your car’s engine. Viscosity is the term for the oil’s thickness. If the oil is too thick or too thin, it won’t be able to adequately protect your car’s engine, which can result in damage. Most manufacturers provide two different viscosity recommendations. The main recommendation is what will be the absolute best choice for maximum protection and performance. The other recommendation is called an alternate-weight oil. While not as ideal as the first oil, the alternate-weight can be safely used when the first type isn’t available. Certification should usually be pretty easy to find right on the oil container. Only synthetic oil can meet these standards, so you won’t find any standard oil certified by the SAE and API. Be careful about any synthetic oil which is certified by an organization besides the SAE and API. Some lower quality synthetic motor oils create their own official-sounding organizations to then certify their own motor oil. These synthetic motor oils will likely be brands you’ve never heard of at prices which are a bit too good to be true. Many people assume that because synthetic oils aren’t refined from petroleum, they’re safer for the environment. Unfortunately, that’s not necessarily the case. The process used to make synthetic oil still releases environmentally-damaging chemicals. However, synthetic oil does have some environmental benefits. Synthetic oil makes the engine run cleaner. Plus, the lower volatility of synthetic oil results in less vaporization throughout the exhaust. Synthetic oil decreases engine resistance while increasing horsepower, which means the car needs less gas to perform at a high level. This is Castrol’s most advanced full-synthetic motor oil designed to avoid metal-to-metal contact during all levels of driving speeds. Castrol Motor Oil is a favorite among top-performing racecar teams as well as everyday drivers around the world. The 03084 EDGE is their premier motor oil engineered with fluid titanium technology. This allows the oil to avoid viscosity breakdown even at high-performance levels. This is an oil created specifically for modern, high-powered engines, which are roughly twice the size of engines built just 30 years ago. 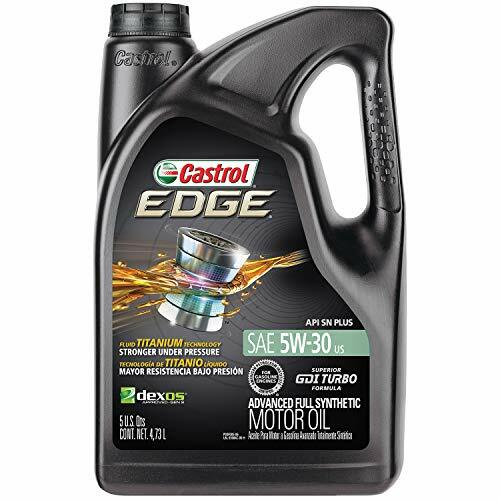 Large engines have the potential for harmful metal-to-metal contact, but the Castrol EDGE motor oil is designed to provide lubrication across the engine for the entire drain interval. 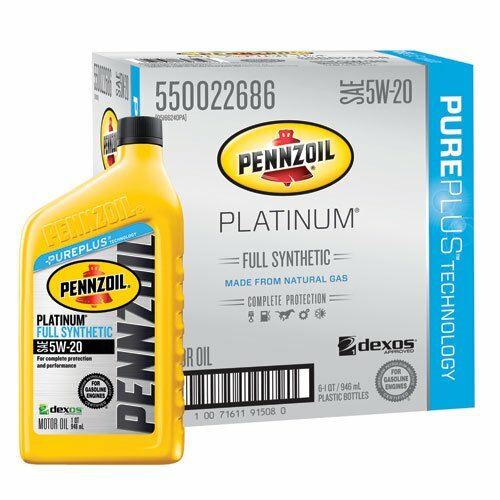 While all synthetic motor oils help reduce engine sludge, Pennzoil Full Synthetic Motor Oil uses Super Active Cleaning Agents to specifically target and remove intense sludge buildup. Conventional oil can break down and cause sludge buildup, which can slow or even stop your engine. Pennzoil 550022686 uses unique Cleansing Agents to remove this buildup quickly. Not only meets all industry requirements for cleanliness but actually exceeds them quite significantly. This motor oil is also a great choice for harsh weather including both hot and cold climates. Formulated to help protect your engine from damage due to excessive humidity, heat and water exposure. 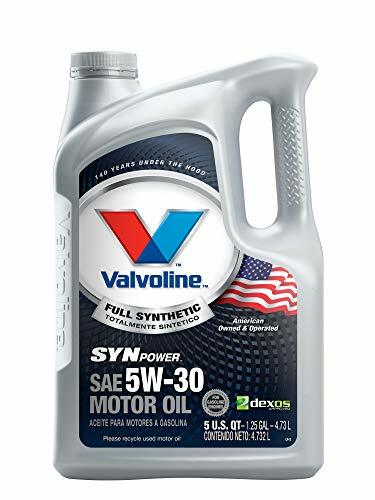 Certified for use in practically all major turbo and supercharged passenger cars in North America, Valvoline SynPower 5W-30 cleans the engine while delivering maximum performance. Valvoline understands that because their oil is designed to last long, you might have a question about usage well after you’ve purchased the product. So they offer a dedicated customer support line at 1-800-TEAM-VAL to provide answer to any product or technical questions about their motor oil. But most people have absolutely no problems with the SynPower line of motor oil. This is Valvoline’s high-performance oil designed for virtually all high performing passenger cars on the market. Plus, the motor oil also removes sludge while protecting varnish. Keeps the engine running smoothly even in harsh weather and extreme temperatures. Allows for an average of 10,000 miles between oil changes. A heavy-duty engine oil which improves fuel economy while also providing plenty of protection to diesel-powered vehicles. 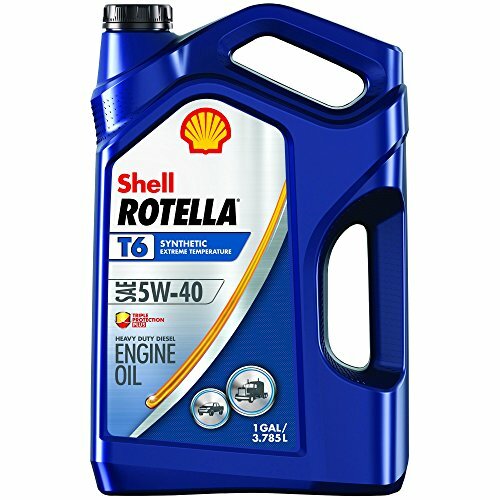 Heavy-duty diesel pickups, tractor-trailers and other diesel-powered vehicles also benefit from synthetic oil, and Shell ROTELLA T6 Diesel Engine Oil is specifically formulated for their unique demands. The Triple Protection Plus formula helps prevent damage from dirt, soot and other environmental hazards unique to heavy-duty diesel vehicles. Additionally, this synthetic oil improves overall fuel economy by 1.5% compared to other SAE 15W-40 oils. After all, every bit of savings helps. Also helps maintain optimal engine pressure even under stressful, hard-working conditions. A versatile synthetic motor oil designed to help conserve energy while also delivering high performance in both hot and cold weather. Liqui Moly doesn’t have the name recognition of the other oils on our list, but they remain a consistent favorite of both professional and D.I.Y. mechanics around the world. 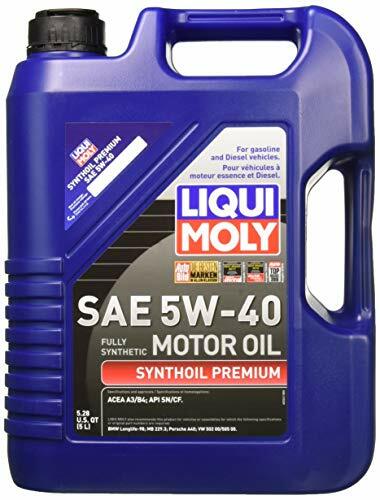 Their High Tech 5W-40 Motor Oil is a full synthetic oil suitable for both gas and diesel engine concepts. The oil is also designed for multi-valve arrangements, variable cam and time configurations, turbocharging, supercharging and other high-performance situations. Provides instant lubrication after a cold start, making it perfect for use in all types of extreme climates. Ideal for cars which are driven everyday as well as cars you’ll want to safely store for an extended period of time. Motor oil is the lifeblood of your vehicle. The right oil will dramatically improve your vehicle’s performance and fuel efficiency while decreasing environmental impact and risk of engine damage. While many cars allow for both conventional and synthetic oil, most drivers prefer the benefits of synthetic. Synthetic motor oil is usually the most cost-effective, reliable solution suitable for the widest range of weather and driving conditions. Using our guide above, you’ll be able to choose the best synthetic motor oil for your needs. A whole new world of adventures awaits you on the road today!